He's bald with serpentine dragon tattoos on his scalp that seem to move when no-one's looking (not that that effect can be conveyed, but it a little sorcerer quirk). His right ear is torn at the lobe and cauliflowered on the helix and his left ear has two hoops piercing it (one lobe, one higher up, near the top. His expression is set in a near permanent scowl and a scar crosses his left eye (but doesn't touch it) and vanishes into his beard). His beard reaches to mid-chest. His left arm has a pentadactle dragon's claw brand on it. Clothing is faily simple, breeches, heavy hobnail boots, a belt with numerous pouches for alchemical items (thunderstones and what not) and a bandoleer of daggers (5) across his chest. His only other clothing is a pair of spiked brass knuckles and some monke-like wrappings to mid-forearm on his hands. 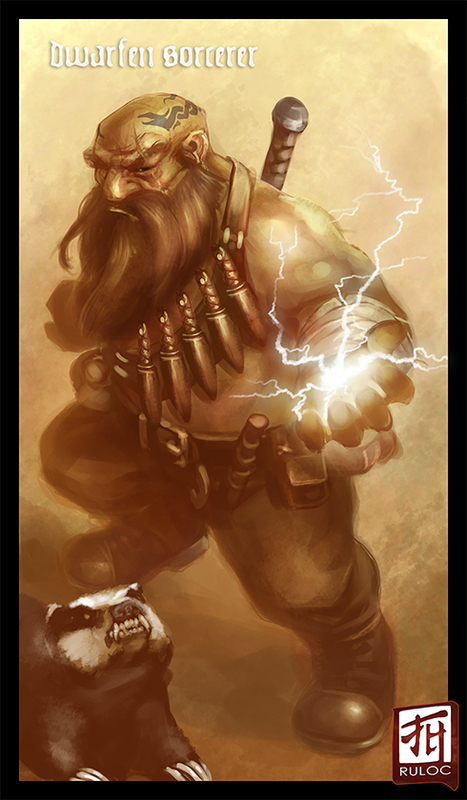 He carries a Dwarven waraxe slung across his back (it hooks on the bandoleer). He's accompanied by his Badger familiar at all times. Thought you might be more likely to see this here. Thank you this is the most spot-on character rendering I have seen in ages. He's missing the dragon claw brand on his upper arm, but that is minor. And I love the Badger!! Should you want to retitle this, the character's name is Eberk Linnormsen, the badger is named Lazy.